I have a new book of poetry to share! I haven’t written on my blog in a long time because I’ve been busy working on my poetry! 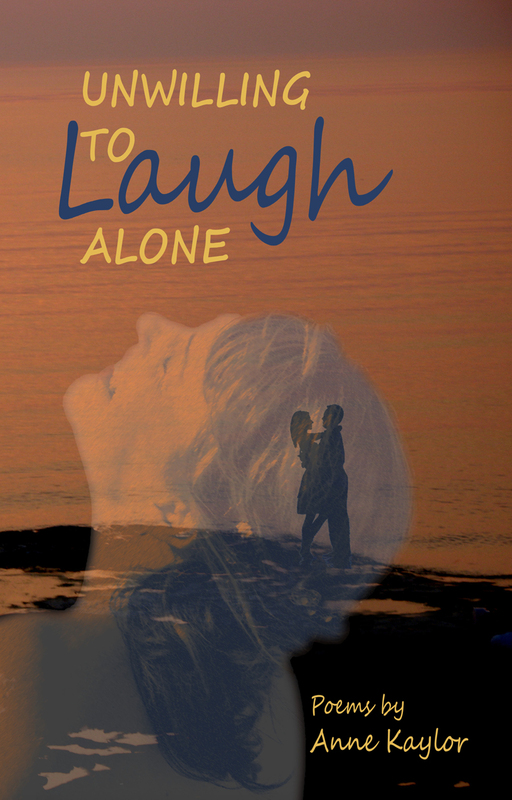 And I am delighted to relay that my new poetry collection, Unwilling to Laugh Alone, is finished. Now I need YOU to make it a bestseller. This book offers something for everyone—to entice you further, I’ve included sample poems below and you can check out my bio, reviews of the book, and other poems via the link below to my publisher’s website. Thanks to Main Street Rag Publishing Company, Unwilling to Laugh Alone will be released November 2015, just shy of my 50th birthday. It will sell for $14 cover price. BUT you can pre-order now for just $7.50 (plus tax & shipping) by following this link to the MSR Online Bookstore: http://mainstreetrag.com/bookstore/product/unwilling-to-laugh-alone/. In case that link doesn’t work, please visit http://mainstreetrag.com/bookstore and go to “Coming Soon” and look for Unwilling to Laugh Alone. Alternately, Main Street Rag does take checks. The price is a flat rate of $12.50 per book regardless of quantity, which includes shipping and sales tax. Let me know if you want me to email you the mail-in order form to pay by check. Please remember your advance order gives you this fantastic discount, but you’ll have to wait to receive the book in November—just IN TIME for my 50th! So, order now! as age bends me, too. each reaching for our last rest. sagging, his view clings to earth. or the rest of life. small words make all our difference. My brother, Ken, would be proud of me for actually knowing enough to quote a Grateful Dead song title correctly. But, frankly, I had to look it up on google to make sure I got it right. I’m not a fanatic fan, but no one can deny there were never truer words—and they certainly appeal to me right now, especially regarding the past year and a half of my life (which is about how long it’s been since I wrote on this blog). Let’s just say… I’ve been a little overwhelmed. Everything that’s happened has been the most incredible—and strange— journey, and nothing has been easy. That day at the hospital when James had spinal surgery (he’s okay, btw) went on, LITERALLY, all day. We arrived before 10:30 am. I was there for 12 hours. Giving all the details would bore you or bring you to tears (as I was at 10:30 PM when I finally got to visit him in his room). The wedding planning became my life not long after that. It turned out to be a full-time job, but well worth it. All the planning in just four months—and all the wonderful people we worked with—culminated in my dream come true. We were married on the beach, our toes (okay, my toes) in the sand, with all our siblings and many friends present. That was definitely the happiest day of my life (that and every time James wakes up from surgery). I have to wonder: why do we take only one day to celebrate a wedding, one of the most pivotal days of our lives? Those 12 hours in the waiting room at CMC felt like forever; those 4 1/2 hours for the wedding and reception felt like a split second. I can remember each of those agonizing 12 hours, yet I struggle to remember the many great moments of my wedding day. I’m mostly grateful that my friend and photographer, Lisa Ellis, did such a great job of capturing my memories for me. Kudos to Will Weaver, too, another friend, who took so many special photos of the whole event. And thanks to Donna Hart, my friend who I begged to video the event and gave me some priceless moments to laugh at forever. So, what am I writing about in this blog? I’m writing about being grateful and NOT being dead. Blunt? Yes. True? Absolutely. Life gives us lots of opportunity and lots of hardship. How we deal with it is completely our choice. Sound cliché? That’s because it is, but it’s STILL true. We weren’t prepared, after James’ surgery, to have a wedding. But we’d known for a long time we wanted to be together for the rest of our lives, so waiting to say so was silly. Every day is about waiting, and every day is about acting on what is truly important to us. Right now, I have a husband who loves and adores me—and I love and adore him—and we relish in all the moments we spend together, especially when we’re both working 10-hour days more often than not, and weekends, too. Basically, I’m reintroducing myself to you. I am officially Anne Kaylor, and I am absolutely proud to be so! And I’m offering the idea that I’ll be back. Best to anyone who still occasionally visits here! … then it hits me. Despite how many months I go without writing on my blog—I need this; I need your feedback. Always, you have been kind, and I thank you. And, tonight, I struggle and need that reassurance that you still “check me out from time to time.” And I have to ask the question of all of us: how do we juggle the everyday with the creative side that longs to grab hold? My plight? I’ve been reviewing good writing from others—it’s my job as an editor and, yes, I know I’m lucky—but, I have to say, it inhibits my own appetite for writing at times. Plus … Cheryl, my best friend and housemate of 20+ years, is getting married in January and we’re planning her destination wedding in Dominica. James, my fiance, and I are striving to sell his house so we can find our home. Work is crazy good but overwhelming. My mom is in a “space” so she hasn’t spoken to me in nine months and I’m stalled on that count. My sister is dealing with marital issues, and my brother is just wiped out dealing with Mom, my “off-center” 90-year-old Uncle Arthur, and all the rest of the family. And my Godfather Uncle Kenny died last week. Thus, the crux. I’m inspired to write. But time is another matter. How do we write when we are inspired but just too tired? Where do we find the energy? I’ve gotten into Pandora lately (hey, new phone/new realization), at first just to have background noise while I was working. Then I thought about plugging in my guilty pleasure—“Glee.” Okay, so I was not a fan or watched the show … until lately. Cheryl gave me a Kindle Fire for Christmas, and “Glee” showed up when I was playing around in the Netflix free zone, so I decided to check it out (sue me, I was curious). So, I plugged the “Glee Cast” into my Pandora and, surprisingly, the resulting songs got me into a writing groove—a real mix of angst-slash-feel-good-groove-slash-new-inspiration mode. To be honest, this “podcast” came just at the right time. I’m not sure—six months later/earlier—it would hit me at all. But, right now, I needed a reminder of things past and how hard the struggle “was” (as opposed to is). Just one more promo … “Defying Gravity” is the song that, typically, pops up within one of the first three in the “Glee” Pandora mix. Well, I can only think, “That’s what I want to do/who I want to be!” TOO telling (the song is from “Wicked”—I read the book/have to see the musical now). We all find inspiration in the weirdest places … and I’m not afraid to say I’m hooked on whatever gives me inspiration. Hope you are, too.